Google Adwords is one of the largest online advertising networks and Google’s flagship product for small business marketing. It provides the fastest way to appear on first page of Google – under sponsored listings. It has many free tools and features to research, target, track and improve your online advertising campaign. The only problem is that Google adwords has a steep learning curve. 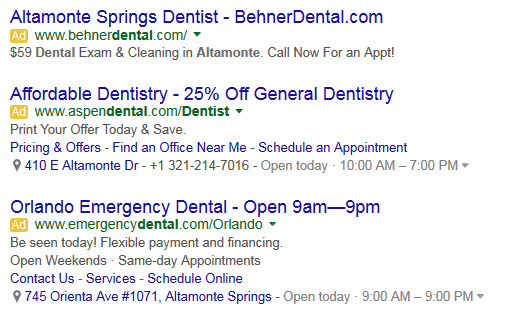 Many dentists who try Google AdWords don’t really know how it works and end up wasting a lot of money. Even campaigns setup by Google reps aren’t really optimized for best results. Therefore it is highly recommended to hire a Google certified dental ppc advertising expert to setup and manage your Google Ads. Google Adwords offers two main types of advertising options for dentists – search advertising and display advertising. It is important to understand how each type of advertising works to achieve optimal performance. The Google search network refers to a group of search-related websites where your ads can appear. Websites include Google search sites, as well as other Google sites and non-Google websites that partner with Google to show ads (search partners). When you advertise on the Search Network, your ad can show next to search results when someone searches with terms related to one of your keywords. The Search Network is part of the Google Network, name for all the webpages and apps where AdWords ads can appear. Google search sites: Ads can appear beside, above, or below search results on Google Search, Google Play or Google Shopping. Google search partners: Ads might appear with search results on websites of Google search partners. For text ads, search partners include hundreds of non-Google websites, as well as Google Maps, Google Video, and other Google sites. The Display Network (formerly known as the Content Network) is one part of the Google Network. It is a group of more than a million websites, videos, and apps where your ads can appear. Sites in this network show relevant AdWords ads. Your ads can be automatically matched to websites and other placements like mobile phone apps, when your keywords are related to the sites’ content. You can also choose to target specific sites, pages about specific topics, demographic groups, and more. With over 2 million Display Network sites that reach over 90% of Internet users worldwide (Source: Comscore), there are a lot of opportunities to reach customers. However, to target your customers effectively, choose campaign settings and add targeting methods to your ad groups that specify the conditions for when your ads can show on the Display Network. As a dentist, you should stick to advertising on the Search Network. This is because people who are searching for dental procedures and local dentists are more likely to make an appointment then somebody browsing the web. You can still make some use of display network by running a re-marketing campaign. However, for the most part, dental practices will get by far the best results from the search network.